Subscription companies are growing nine times faster than the S&P 500. Why? Because unlike product companies, subscription companies know their customers. A happy subscriber base is the ultimate economic moat. Today's consumers prefer the advantages of access over the hassles of maintenance. Simply put, the world is shifting from products to services. 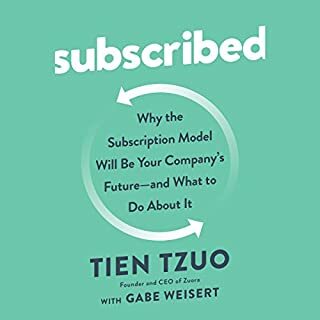 As the CEO of the world's largest subscription management platform, Tien Tzuo has helped hundreds of companies transition from relying on individual sales to building customer-centric, recurring-revenue businesses. The lifeblood of your business is repeat customers. But customers can be fickle, markets shift, and competitors are ruthless. So how do you ensure a steady flow of repeat business? 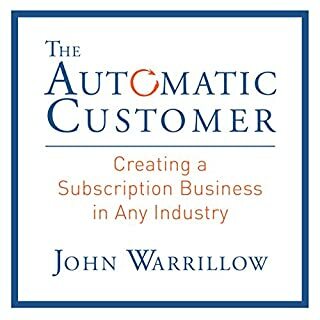 The secret--no matter what industry you're in--is finding and keeping automatic customers. These days virtually anything you need can be purchased through a subscription, with more convenience than ever before. 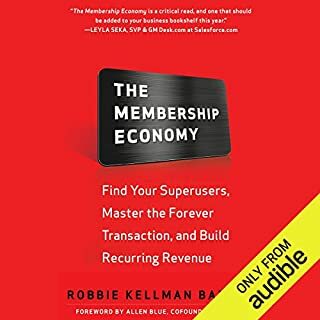 Forget the old concept of the traditional retail model, get in on the new early wave of membership marketing that will turn your business into a cash-flow machine. 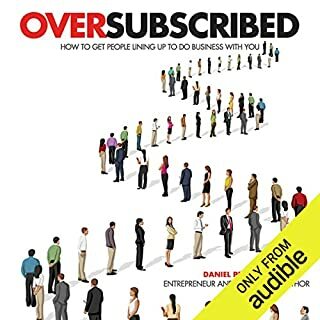 Whether your goal is to escape your nine-to-five job or create a side-hustle income that runs on its own, this audiobook will show you step-by-step how to market subscription-based business to maximize all your profits. Once you learn how to generate a few customers who pay you periodically for your products or services, the scalability of this model is remarkably high. This book is full of insights, strategies and substance! Seventy-seven percent of the US population is active on social media. Over three billion social media users worldwide. Social media is exponentially more effective and accurate and has much better ROI than traditional advertising and media. Social media marketing is not an option anymore. Your customers - no matter who they are - expect you to reach them the way they communicate. The vast majority of companies have inadequate social media marketing strategies. Most companies are playing catch-up with current digital marketing trends, and their strategies will be outdated by the time the company has mastered them. Radical generosity is the against-the-grain secret weapon of real influencers, and it will allow you to boost referrals, retention rates, and ROI like few other strategies. But be warned, gifts with strings attached backfire. There is a right, and wrong, way to give. John Ruhlin has gifted on behalf of everyone from Forbes Magazine to the Fortune 500, and his tactics lead to appreciative responses and wide-open check books. Give wholeheartedly to Giftology and reap the rewards of an expanding business and fruitful relationships, professional and personal alike. You may not have noticed, but the world around you is switching to subscriptions. Have you changed your marketing practices to thrive in this new economy? Subscribers expect different things from businesses than transactional customers. It's up to you to deliver. 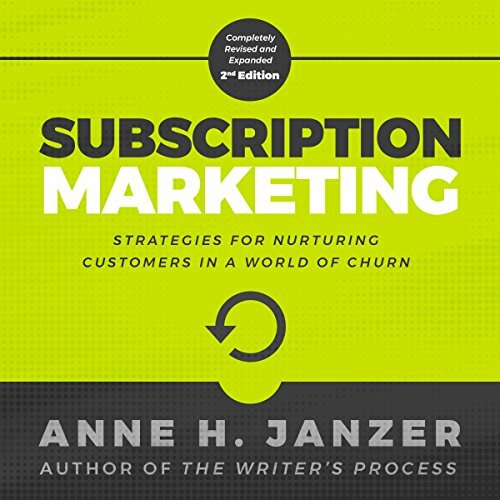 Subscription Marketing is one of the best marketing strategy audiobooks of all time, according to BookAuthority. Find out why. 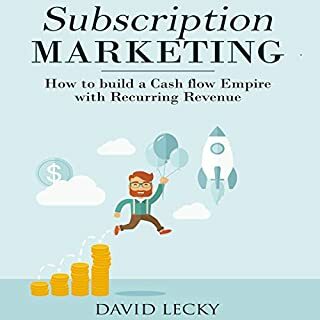 Warning: If you're not offering your products or services on a subscription basis, this book will make you want to start. It's chock-full of thoughtful ideas for both creating valuable subscription offerings and keeping your subscribers happy and on board once they sign up. Beautifully narrated by the author: a great listen! well read by author herself. covers much more than traditional marketing. fast, enjoyable read. good resources on author site. What made the experience of listening to Subscription Marketing the most enjoyable? Finally I have a clearer understanding of an almost invisible method of doing business, subscriptions. 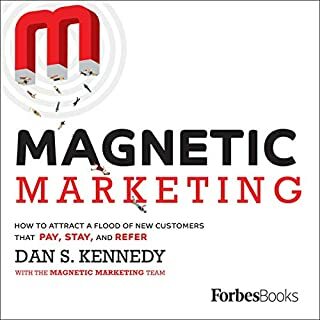 But this book goes beyond subscriptions and lays out a method of giving real value to the customer while maintaining an enduring relationship and avoid churn. My next step will be to purchase printed a printed copy to highlight essential parts and write lots of notes in the margins. Well done!